Collins Booksellers - Stirling Convertor Regenerators by Ibrahim, Mounir B., 9781439830079. Buy this book online. Stirling Convertor Regenerators addresses the latest developments and future possibilities in the science and practical application of Stirling engine regenerators and technology. 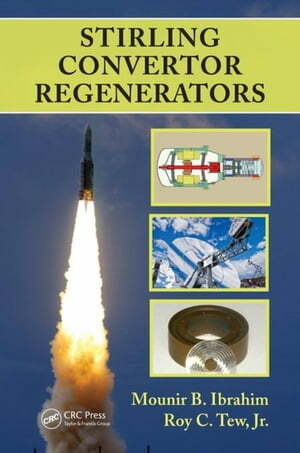 Written by experts in the vanguard of alternative energy, this invaluable resource presents integral scientific details and design concepts associated with Stirling converter regenerators. Content is reinforced with novel insights and remarkable firsthand experience that the authors and their colleagues acquired while working at the National Aeronautics and Space Administration (NASA) and other leading organizations. Intrigued by its special potential to improve energy generation, NASA has been working on Stirling technology since 1980-first for automotive applications, and later for use in generating auxiliary power during space missions. Now, after three decades of development, the Department of Energy and NASA and its contractors have developed a high-efficiency Stirling radioisotope generator (SRG), and NASA plans to launch such a Stirling engine/alternator for use in deep space. With contributions from top experts in their fields, this reference offers a rare insider's perspective that can greatly benefit engineers, scientists, and even students who are currently working in R&D for Stirling machines, as well as other burgeoning areas of alternative power generation-particularly solar and wind technologies. This book is a significant resource for anyone working on application of porous materials in filters, catalytic convertors, thermal energy storage, electronic cooling, and more.